Wow! What an incredible Romantic Love Story to begin with! Introducing Yusra and Shuja, a couple whose undying love for each other cannot be told in words. But we shall just try to give you a snippet of the same. Shuja is American by birth and he was visiting India for the second time when he first met Yusra. On the other hand, Yusra had met with a minor accident and ruptured the ligaments around her left foot so she couldn't walk for a few weeks including the time he was visiting. Shuja being a gentleman decided to meet her for tea at her house as they had been speaking for 6 months by then. There was an instant spark! They spoke for hours and hours. And Yes, the magic happened. He had never seen her walk and it would be time for him to leave before he did but he went back to USA and proposed. He was known as the guy who didn't want to marry someone outside USA and then came all the way to India just to see Yusra. Now comes the most interesting part where Shuja sent Yusra a letter proposing to her (I know in the era where technology is booming he chose a letter to communicate his feelings...of course nothing beats a personal touch!) It had two boxes checked Yes and No. And she of course, ticked 'YES' beside will you marry me? And here we are sharing with the world their celebration of coming together forever and ever! Take a look and enjoy! 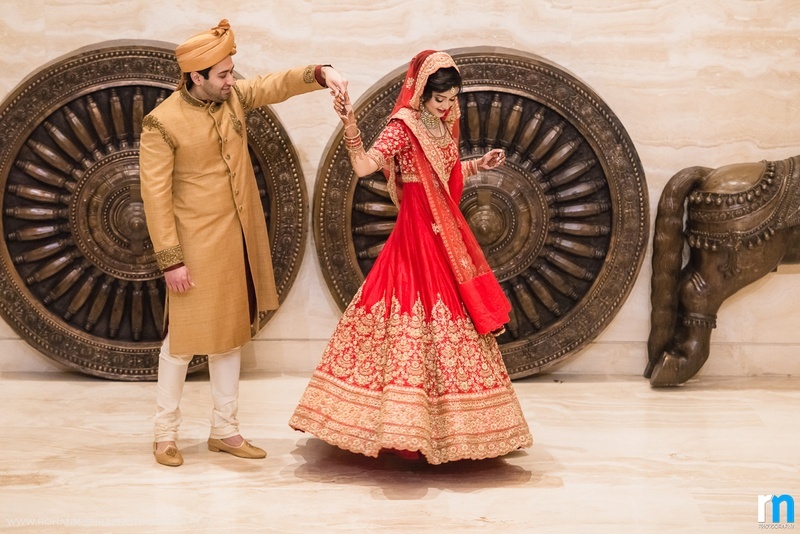 The Mehndi and Sangeet took place at the 7 star hotel, ITC Grand Chola, Chennai. The mehndi session had Yusra looking subtly beautiful in a simple white lehenga paired with a yellow choli. She rocked the recent mehndi trends with minimal designs along with mandala motifs. The theme of the decor by Prabha Talwar was a blend of traditional and modern ideas with heavy use of orange and yellow Marigold garlands and drapes. It had a beautiful "Mehendi Corner" exclusively made for the ladies. As a giveaway colorful bangles were also distributed amongst the Ladies. For the Sangeet, she wore a gorgeous green lehenga along with a glittery gold choli and a sheer dupatta. She accessorized beautifully with a statement paasa and matching earrings. Her better half looked colourful in a royal blue kurta set under a pink jacket. The Sangeet menu had a theme of "Áround the World" as the guests were a mix of Indians and Americans. They also had some fun dance performances from the bride's side where all the cousins and friends danced their heart out on the music played by DJ Ashish. Yusra wanted a royal look for her wedding and she did choose an expert who can fulfil this wish and it was none other than Saroj Jalan. Saroj Jalan is known for her ethnic patterns and royal designs that take us close to our cultural roots and reminds us of the glorious and majestic past; and that is exactly what Yusra got. She looked simply breath-taking in her regally red anarkali with intricate old work. Shuja complimented her in an equally royal gold sherwani. The wedding also took place at ITC Grand Chola for the obvious reasons and this time the decor again had a contemporary look in a very neat and stylish way. Prabha Talwar once again incarnated the Royal Finesse concept to the wedding by using pink, white and gold as the main colors for the theme. Shuja complimented Yusra seamlessly in his gold Sherwani designed by Nasir. The couple completely stole the show with their looks. All in all, it was a Grand Royal Wedding which brought together 2 souls for a lifetime.